Oil markets picked up some small gains yesterday, though nowhere near as much as they lost on Tuesday, following an EIA report that was less dramatic than the API report. Crude prices managed to pick up 27 cents yesterday, though prices once again trended lower early this morning. Prices have recouped those losses and are currently at $55.32, just a penny off from yesterday’s close. Diesel prices managed to pick up 2 cents yesterday, despite the EIA’s less than enthusiastic diesel inventory report. Diesel prices rose a surprising two cents (1.0%) yesterday, outpacing crude’s gains. The disproportionate diesel gain was especially unexpected given declining diesel demand and an unenthusiastic stock draw, though generally strong export levels could have been the source of strength. Diesel prices have weakened this morning, falling .26 cents (0.1%) to trade at $1.9061. Gasoline prices are the biggest loser this morning, and only eked out a .4 cent gain yesterday. Gasoline stocks reversed a three-week string of declines, with weak demand leaving more gasoline for storage. It’s worth noting that despite draws, gasoline stocks are closer than diesel or crude stocks to 5-year averages, just 3 million barrels above the average. Gasoline is leading the losses this morning, with prices at $1.7266 after falling 1.2 cents (0.7%). The EIA released their inventory report yesterday, and the general sentiment was that the news was bearish, but not as much as the API report. The API report showed a net gain of 6.4 million barrels (MMbbls) between the three products, while the EIA only showed a net 2.0 MMbbl gain. Of note, refinery utilization surpassed 90% for the first time since Harvey, indicating that refineries are responding to high fuel crack spreads (the difference between a barrel of fuel and a barrel of crude; also a rough estimate of refiner margins). High export levels continued, helping to offset some of the high production. On the international front, OPEC continues to send mixed messages about an extension of the production cut beyond March 2018. While markets are widely expecting an extension to the end of 2018, Russia continues to balk, saying that It’s still too soon to commit to an extension. 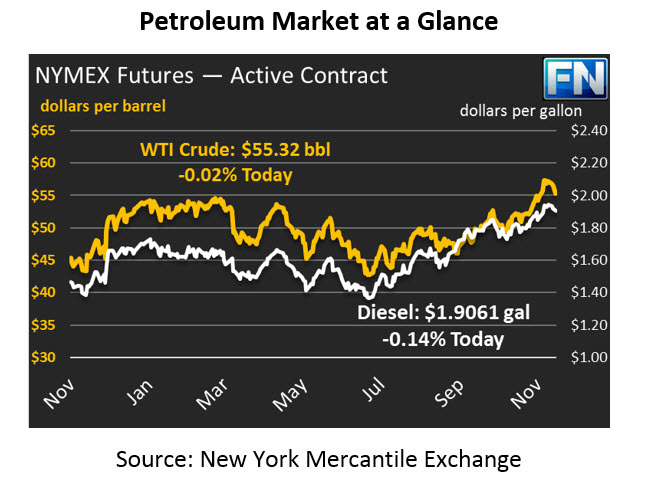 With OPEC’s Nov 30 meeting quickly approaching, markets are growing nervous that the deal extension may not happen, which could cause prices to give up their recent gains.